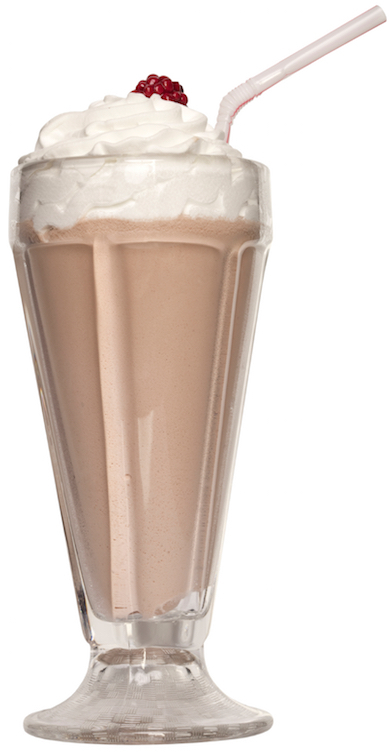 Just one high-calorie milkshake was enough to make metabolic syndrome worse for some people. And overindulgence in just a single meal or snack (especially junk food) is enough to trigger the beginnings of metabolic syndrome, which is associated with the risk of developing cardiovascular disease and diabetes (obesity around the waist and trunk is the main sign). That finding by researchers at the Microbiology and Systems Biology Group of the Netherlands Organisation for Applied Scientific Research (TNO) was reported in the online edition of the Nov. 2015 issue of The FASEB Journal. For some people, “acute effects of diet are mostly small, but may have large consequences in the long run,” said TNO researcher Suzan Wopereis, Ph.D., senior author of the report. The researchers gave male volunteers in two groups a high-fat milkshake consisting of 53% whipping cream, 3% sugar, and 44% water (1.6 g protein, 16 g fat, and 3.2 g carbohydrates). The first group included 10 healthy male volunteers. They were also given a snack diet consisting of an additional 1300 kcal per day, in the form of sweets and savory products such as candy bars, tarts, peanuts, and crisps for four weeks. The second group included nine volunteers with metabolic syndrome and who had a combination of two or more risk factors for heart disease, such as unhealthy cholesterol levels, high blood pressure, high blood sugar, high blood lipids, and abdominal fat. Both groups had blood samples taken, before and after the snacks. In these blood samples, the researchers measured 61 biomarkers, such as cholesterol and blood sugar. For the subjects with metabolic syndrome, the blood tests showed that biochemical processes related to sugar metabolism, fat metabolism, and inflammation were abnormal. For the 10 healthy male volunteers, the blood tests showed that signaling molecules such as hormones regulating the control of sugar and fat metabolism and inflammation were changed, resembling the very subtle start of negative health effects similar to those found at the start of metabolic disease. Metabolism maintains homeostasis at chronic hypercaloric conditions, activating postprandial response mechanisms, which come at the cost of adaptation processes such as energy storage, eventually with negative health consequences. This study quantified the metabolic adaptation capacity by studying challenge response curves. After a high-fat challenge, the 8 h response curves of 61 biomarkers related to adipose tissue mass and function, systemic stress, metabolic flexibility, vascular health, and glucose metabolism was compared between 3 metabolic health stages: 10 healthy men, before and after 4 wk of high-fat, high-calorie diet (1300 kcal/d extra), and 9 men with metabolic syndrome (MetS). The MetS subjects had increased fasting concentrations of biomarkers representing the 3 core processes, glucose, TG, and inflammation control, and the challenge response curves of most biomarkers were altered. After the 4 wk hypercaloric dietary intervention, these 3 processes were not changed, as compared with the preintervention state in the healthy subjects, whereas the challenge response curves of almost all endocrine, metabolic, and inflammatory processes regulating these core processes were altered, demonstrating major molecular physiologic efforts to maintain homeostasis. This study thus demonstrates that change in challenge response is a more sensitive biomarker of metabolic resilience than are changes in fasting concentrations.—Kardinaal, A. F. M., van Erk, M. J., Dutman, A. E., Stroeve, J. H. M., van de Steeg, E., Bijlsma, S., Kooistra, T., van Ommen, B., Wopereis, S. Quantifying phenotypic flexibility as the response to a high-fat challenge test in different states of metabolic health.